Dramatic reading: "For Colored Girls..."
Join the Black On Black Project for an intimate stage reading of "For Colored Girls Who Considered Suicide When the Rainbow is Enuf" directed by Kyma Lassiter. The reading will be surrounded by Dare Coulter's exhibition "Right Before We Fly and takes place Friday, March 9, 6:30 p.m. at Anchorlight in Raleigh. RSVP here. "For Colored Girls Who Considered Suicide When the Rainbow is Enuf" is an acclaimed choreopoem that is a series of 20 poetic monologues accompanied by dance and music. This event will be a dramatic reading of some of the monologues followed by a conversation about how it relates to Coulter's exhibition. This event is a peek inside the powerful work, which will open on April 21 at St. Augustine University and is produced by The Justice Theater Project. 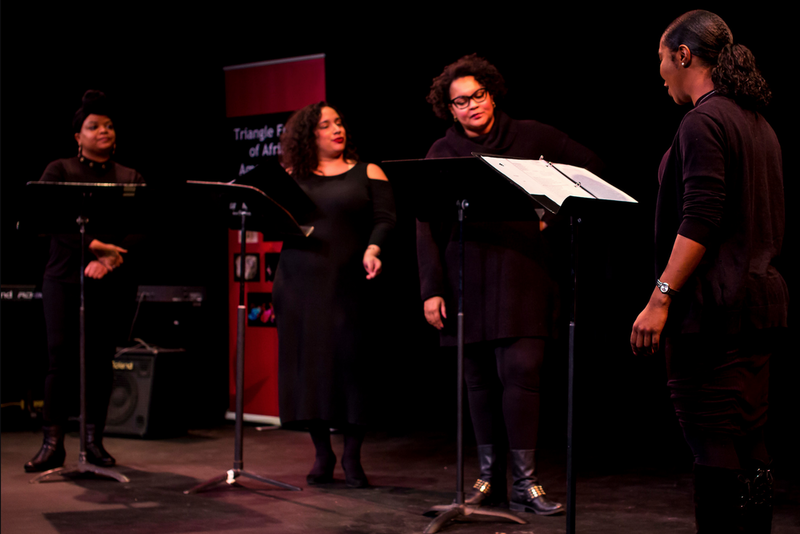 The ensemble will feature seven African-American women who will tell their interconnected stories of faith, love, empowerment and loss. Dramatic reading: "For Colored Girls..." is part of the community programming around Coulter's exhibition, which is a sculptural installation that focuses on our audacity to dream beyond the limitations that are set before us. About "Right Before We Fly"